In a World rife with Ninja, one boy seeks to become the greatest ninja there ever was. That boy is Naruto Uzumaki, a twelve-year old ninja-in-training who tries to make up for his lack of talent and intellect with enthusiasm and sheer determination. However, Naruto's cheerful disposition hides a dark secret: when he was but a baby, his hometown of Konohagakure ("The Village Hidden In the Leaves") was attacked by a monstrous demon known as the Kyubi ("Nine-Tailed Fox"). The beast was eventually subdued, but not before it had killed many of the strongest ninja of the village. Furthermore, the beast had to be contained in the infant Naruto's body, and the boy has had to grow up with the stigma of basically being a living prison for a demonic monster. But like any good Shonen protagonist, Naruto doesn't let this slow him down. He continues to pursue his ambition of becoming the next Hokage ("Flame Shadow", a title for the head ninja of his village). The manga Naruto, written by Masashi Kishimoto, follows the story of his pursuit of greatness, with the help of his teammates (Angst-ridden Anti-Hero Sasuke and hot-headed love-interest Sakura), and eventually moves to encompass their struggles against Big Bad Orochimaru, ruthless leader of the rival village of Otogakure ("Village Hidden in the Sound"), and the S-Class criminal organisation Akatsuki. On February 8, 2007, the original series ended after 220 episodes, of which 96 were filler and 85 of those were infamously consecutive. The continuation, Naruto: Shippuden, debuted on February 15, 2007. It focuses on the further adventures of the now-16-year-old Naruto. The English dub ran on Toonami in the US. When the news first spread that Naruto was hitting the States, despite the fanbase's fears, 4Kids had little, if any interest. But Viz Media had plenty of interest, since they scooped up the license and dubbed it for the US audiences. At first, it seemed like it would be marketed as a kiddie show with blood - Never Say "Die" was in full effect - but the Wave Country arc onwards saw free usage of the words "kill", "die", etc. Also notable is that as of January 2009, an official English subtitled version of the anime will be available for a subscription fee as little as an hour after the Japanese broadcast on and available subtitled for free on this site which started with the beginning of Shippuden and has since caught up. For American users, the television site Hulu features the episodes for free a week after they're aired, catching up at the same rate. Which is good, considering Cartoon Network stopped airing the show when there were only 11 episodes of filler left (though luckily episodes in either language are still available on iTunes and coming out on DVD). 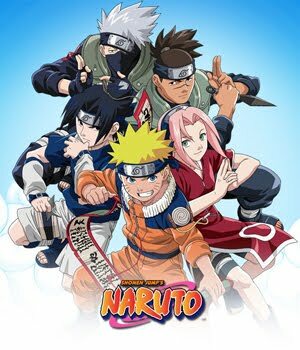 If, like many of us, you don't live in the U.S., you can also watch Naruto for free within an hour of it being broadcast in Japan at Crunchyroll. Dubbed episodes of Shippuden are now airing on Disney XD as of October 28, 2009. The broadcast dub is about as edited Cartoon Network version give or take a degree. Uncut dubbed episodes are available on iTunes, usually released before the TV broadcast. In case you hadn't gathered yet, Naruto has been THE most popular manga/anime in America for the past few years. It currently outsells every other series, although general anime and manga sales have been decreasing. It doesn't do that badly outside of America either, but inside Japan (and taking into account the world at large), it's not nearly as popular as some other series (though, that said, it has consistently remained in second place since 2008). Several licensed games have been made, such as Naruto Shippuden Ultimate Ninja Storm 2, Naruto Shippuden Ultimate Ninja Storm Generations and the Naruto Clash of Ninja series. A spinoff series called Rock Lee's Springtime of Youth was also made. Not to be confused with the series with the similar-looking name. And DEFINITELY not to be confused with a terrifying horror manga called Uzumaki.